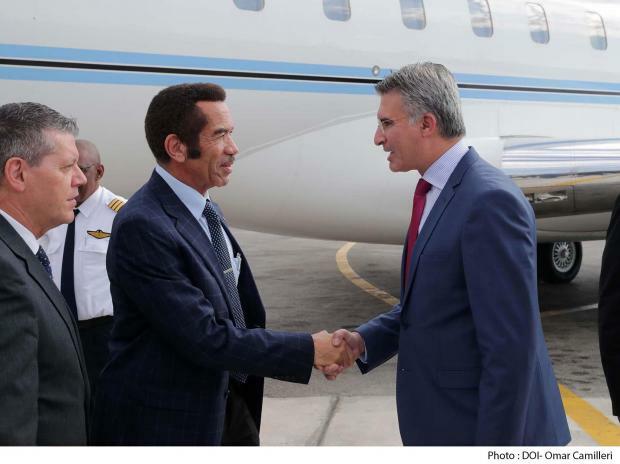 Updated 5.15pm - Botswana President Khama Ian Khama has started a state visit to Malta. He arrived this evening and was welcomed by Foreign Minister Carmelo Abela. He will have talks with President Marie-Louise Colerio Preca, Speaker Anġlu Farrugia, Prime Minister Joseph Muscat and Opposition leader Simon Busuttil. The two countries are expected to sign a double taxation avoidance agreement. Botswana is one of the Africa’s most stable countries and the continent's longest continuous multi-party democracy. President Khama, in office since 2008, was born in the UK while his father was in exile. He is a graduate of Sandhurst college in Britain and was the commander of the Botswana Defence Force (BDF). He held the rank of Lt General.